The express boat, Foldafjord, services the route Namsos – Rørvik – Leka, and is the easiest way to get to Leka using public transportation. By car, it is about a 5-hour drive from Trondheim to Leka, and Leka is located about 2.5 timer south of Brønnøysund. 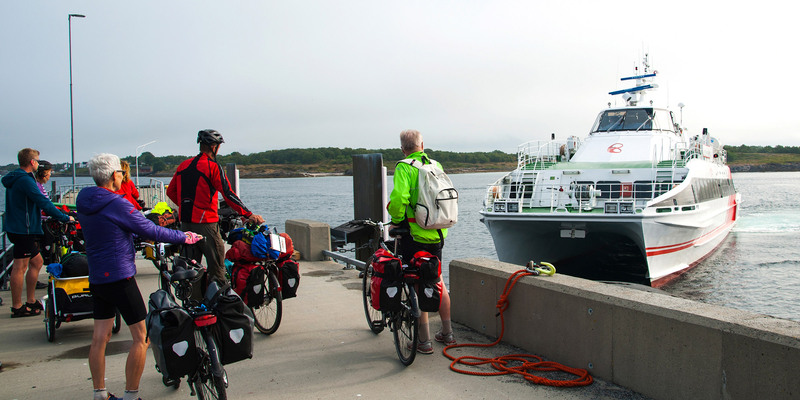 The ferry, M/F Leka, has regular service between the ferry landing at Gutvik (on the mainland side) and Skei on Leka. You must take the Leka Ferry from Gutvik to Skei in order to get to Leka. The duration of the ferry ride is about 20 minutes. Timetables for Leka Ferry (Gutvik – Skei). The fastest route is via E6 up to Gartland just north of Grong, where you cross over to Høylandet and the Coastal Route / Kystriksveien (FV17) and follow this highway up to Kjelleidet in Bindal. Then exit left onto 770 to Gutvik. The drive from Trondheim to Gutvik is about 4.5 hours. The other route exits E6 north of Steinkjer onto the Coastal Route – Kystriksveien, and takes you up to Namsos. From Namsos, follow 769 about one hour up to the ferry landing at Lund, and take the ferry over to Hofles. Many visitors stop at Rørvik, before driving the final hour (roughly) to Gutvik (75 km). Allow a total of 6 hours for the route Trondheim – Namsos – Leka (and a bit more if you plan on stopping at Rørvik). From the north: From Brønnøysund, it takes about 50 minutes down to the ferry landing at Vennesund along Kystriksveien (FV17). The ferry ride Vennesund – Holm takes about 20 minutes, and it is about a 1-hour drive from Holm to the ferry landing at Gutvik. Allow a total of about 2.5 hours from Brønnøysund to Gutvik. The express boat, Foldafjord, has daily service for the route Leka (Skei) – Rørvik – Abelvær – Jøa – Namsos, and is a convenient way to get to and from Leka. See route timetables. Take bus route 23-701 Brønnøysund – Grong (Namsos) down to Kjelleidet. Bus route 23-701 Namsos/Grong – Brønnøysund connects with the train arriving from the south. Exit the bus at Kjelleidet. See also www.avinor.no . From Rørvik, you can either take the express boat, Foldafjord, or use the transport service to Gutvik.